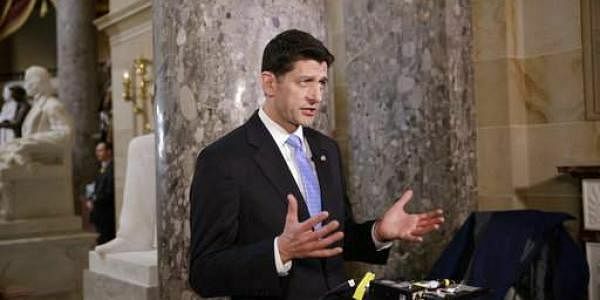 WASHINGTON: In a major setback to President Donald Trump, House of Representatives Speaker Paul Ryan today withdrew a healthcare bill aimed at repealing and replacing the Obamacare policy from vote as the Republican party failed to muster the votes needed to get the legislation passed. The US House of Representatives – similar to the Lok Sabha of the Indian Parliament – has 435 members. The Republican party enjoys a simple majority in the House with 235 members. However due to opposition from some of its own party lawmakers, in particular the one that have grouped themselves under the banner of Freedom Caucus, Ryan, who had been leading the effort on behalf of Trump, could not muster the majority 215 votes. As a result, in an effort to avoid the humiliation of a defeat, Ryan announced today that he was withdrawing the move to have a vote on Affordable Care Act (Obamacare). The White House and Trump had put up a brave face even till the last minute when they tried their best to muster support for their effort to repeal and replace Obamacare. With the writing on the wall, Ryan drove to the White House to inform Trump to inform him he does not have enough votes to see the important legislation pass through the Congress. Unlike India, the US Congress does not have an anti-defection bill, as a result of which US lawmakers are free to exercise their right to vote on a bill as per their wish and not according to dictate of the party leadership. The White House said Trump did everything he could for the passage of the bill. "There's no question in my mind at least that the President and the team here have left everything on the field... It is now going to be up to the members of the House to decide whether or not they want to follow through on the promise to that," White House Press Secretary Sean Spicer told reporters. Similarly, Spicer said, Ryan has done everything he could. "He's worked really closely with the President. I think at the end of the day you can't force people to vote," Spicer said. Senator Mark Warner said it has now become clear that "Trumpcare" has been rejected. Congresswoman Elizabeth Esty said the Affordable Care Act has problems that they need to work together to fix. "The American Health Care Act would solve none of these problems, and the American people know it. Instead of lowering costs or improving the quality of care, this bill would force millions of Americans to pay more money for worse coverage," she said. "Americans throughout the country - including the thousands of folks in my district who called and emailed me - have sent a loud and clear message to Congress that they oppose this cruel and destructive proposal. Today, their voices were heard," Esty said. "We won't fix the problems in our healthcare system with just one party negotiating against itself," she added.